SunRype VP of Business Development Derek Brown (left), Finance Business Manager Kyle Robinson, SunRype CFO and VP of Finance Amanda Burns, Argus Properties President and CEO Ted Callahan, SunRype Communications Manager Barb Broder, SunRype President and CEO Dave McAnerney, UBC Okanagan campus lecturer Svan Lembke and Faculty of Management Dean Roger Sugden celebrate the launch of the 2017 Live Case Challenge sponsored by Argus Properties. Third-year UBC Bachelor of Management students are squeezing everything they have learned to help Sun-Rype Products Ltd., as part of the sixth annual Live Case Challenge. Sponsored by Argus Properties Ltd., Live Case Challenge is the signature experiential learning competition held by UBC’s Faculty of Management at the Okanagan campus. Students in Business Conditions Analysis are given a short timeframe to solve a real life problem, or “live case,” on behalf of a client. Students have six weeks to break down the case and develop solutions drawing on their management knowledge of operations, marketing, supply chain, sustainability, regional development and more. The student teams present their analysis and proposals to expert judges in an intensive tournament format on April 6, when successful teams advance through multiple rounds to the final presentations. Students compete for prizes as well as grades, with Live Case Challenge submissions and teamwork directly impacting their performance in class. “Many students say the Live Case Challenge is a transformative experience—the moment when their undergraduate education comes to life, and they can see how they are capable of leading, managing and thriving in a rapidly changing world,” says Roger Sugden, dean of UBC’s Faculty of Management. “We are thrilled to have SunRype on board as the regional partner this year." This year, SunRype is challenging students to provide an independent review of their business opportunities. Today’s food and beverage market is highly competitive and overflowing with many consumer options. In addition to its popular “Blue Label” apple juice and “Fruit to Go” snacks, the Okanagan-based organization has branched out to include nut-free, gluten-free, vegan, kosher certified and calorie-conscious (“Slim” line) food products. With so many options available, SunRype is using the Live Case Challenge to ask students for recommendations on where they could prioritize or invest going forward. 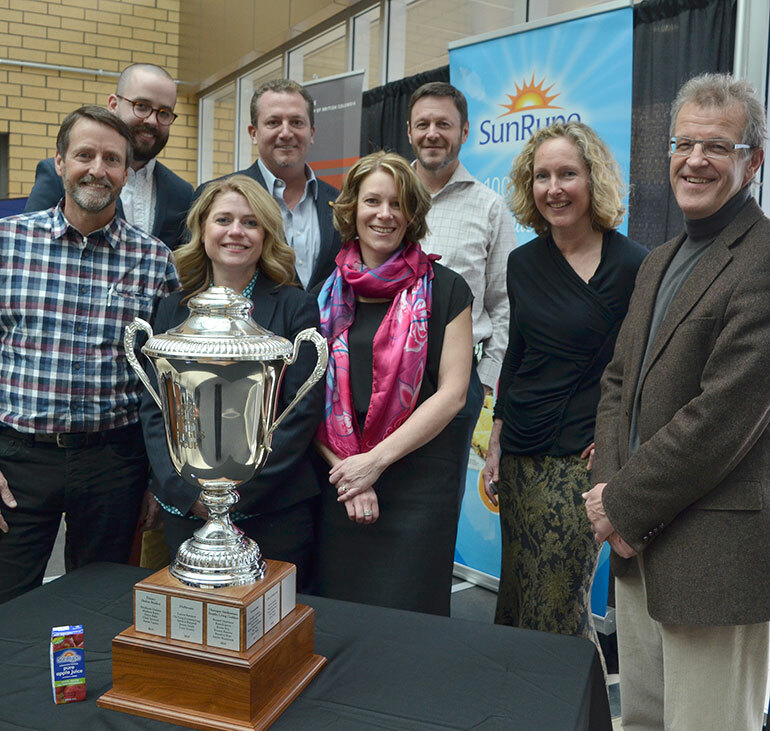 SunRype’s participation builds on their tradition of working with UBC’s Okanagan campus, having contributed more than $140,000 in support of student awards during the past 11 years. “We are excited to partner with the UBC Faculty of Management on this project,” says Dave McAnerney, president and CEO of Sun-Rype Products. “Communities are at the heart of the SunRype brand and we believe strongly in giving back by supporting local programs. We welcome fresh thinking and new ideas. We are really looking forward to engaging with students as part of Live Case Challenge and hearing their insights." Argus Properties Ltd. sponsors the Live Case Challenge because the competition showcases how students collaborating with regional organizations, large and small, can develop flourishing and sustainable businesses, organizations, communities and regions. The winning team receives the coveted Argus Cup and a $5,000 prize, with runners-up earning a $1,500 prize.